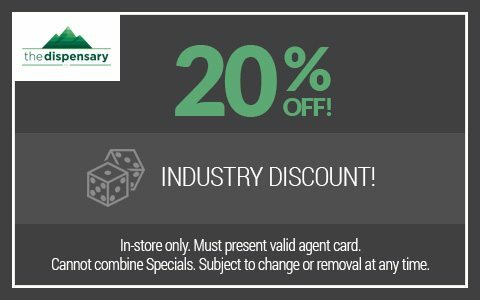 If you’re a fellow member of the cannabis industry, we’re proud to offer you this special discount at our stores! Here at The Dispensary NV, we are proud members of the cannabis industry, offering high-quality products to all of our customers for both recreational and medical uses. Out of respect for our fellow industry members, we are happy to present this special industry discount offer! If you work in the cannabis industry, you can get 20% off our wide range of cannabis products. Simply present this coupon along with your agent’s card to take advantage of this offer. Before you shop with us, you can browse our online menu beforehand. Or if you’d rather, you can look around, and then pick and choose once you arrive. While you are here, you are our guest, and our helpful staff will be glad to assist in any way we can. If you have any questions about our products or this discount coupon, we’ll be happy to provide you with answers. We can help you select the best items to suit your individual tastes and needs. As a member of the industry, you’ll know that smoking marijuana is not legal in public places in Nevada. So if you’re planning a night on the town, we recommend checking out our edibles! They can provide a more discreet, completely legal form of entertainment or medicinal relief — dependent on your desired cannabis effects. We have a vast menu which can fulfill all your cannabis needs. If you’re simply looking to relax after a long day’s work, perhaps you’d be interested in one of our topical lotions. Ease the stress on your body and your mind. If you suffer pain from an injury or illness, suffer from depression or sleeplessness, or have any other aches and pains, our products can help alleviate your discomfort. As you know, cannabis products can be enjoyable, and can also have a wide variety of medical benefits. Cannabis can — in many situations — be taken in place of many prescription medicines, including pain medication, anti-depressants, stimulants, and sleep aids. If you’re considering replacing or boosting any prescription medications via the medicinal effects of Cannabis, you should speak to your doctor first. When you are ready to purchase your desired cannabis products and accessories, head to The Dispensary NV! Whatever it is you’re in the market for, and for whatever reason, The Dispensary NV will have what you’re looking for at a location near you. We have three venues for your convenience — Henderson, Reno, and Las Vegas.